Parenting Article Published - Thanks to You! Thank you to everyone who answered my email query about allowing your own child to quit an activity. 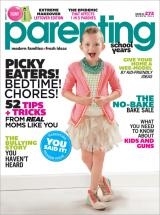 I received many replies, interviewed great parents, and the published article appears in the March 2013 issue of Parenting- School Years Edition, on newsstands now! If you're rushing out the door to buy a copy, the article is on p. 26.